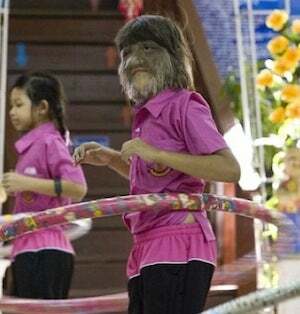 Guinness World Records has named 11-year-old Supatra Sasuphan of Thailand the hairiest girl in the world. According to The Daily Mail, Supatra is one of only 50 known sufferers of Ambras Syndrome, which causes hair to grow on her face, ears, arms, legs and back. In the past, people with the condition were called werewolves and shunned. Sasuphan used to be teased harshly at at school, but she gradually won her classmates over and became popular. She says even more people want to be her friend now thanks to the world record. After winning the title, Sasuphan said, "I'm very happy to be in the Guinness World Records! A lot of people have to do a lot to get in. All I did was answer a few questions and then they gave it to me."